Grandmaster Daniel King examines the game Carlsen vs Grischuk from the Shamkir Chess 2019. Starting February 20th thru February 24th, The 2019 Champions Showdown shall be an exhibition event featuring five individual matches: Hikaru Nakamura vs. Jan-Krzysztof Duda, Fabiano Caruana vs. Pentala Harikrishna, Wesley So vs. David Navara, Leinier Dominguez vs. Veselin Topalov and Sam Shankland vs. Richard Rapport. 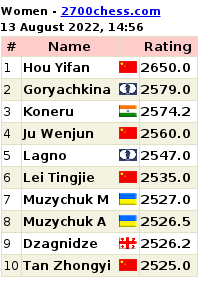 Over five days, the players shall contest games at rapid and blitz time controls. Each matchup will have a prize fund of $60,000 with first place taking $36,000 and second place taking $24,000. Grandmasters Jan Gustafsson and Peter Svidler commentate live on Round 1 of the 2019 Tata Steel Chess Masters in Wijk aan Zee. Daniel King shows the first round game Giri vs Nepomniachtchi from the Tata Steel Chess Tournament. Daniel King shows the first round game Ding Liren vs Carlsen from the Tata Steel Chess Tournament. Schacksnacks redaktion önskar alla sina läsare ett gott nytt schackår 2019! After an exciting 3 way tie for First Place in the 2018 Sinquefield Cup there will be a playoff for who travels to London for the finale of the 2018 Grand Chess Tour. Will it be Fabiano Caruana or Wesley So. Live Commentary provided by GM Yasser Seirawan, GM Maurice Ashley, and WGM Jennifer Shahade. It’s Round 8 of the 2017 Sinquefield Cup, the third leg of the Grand Chess Tour. The 2017 Sinquefield Cup is an elite international event, featuring ten of the strongest chess players in the world. 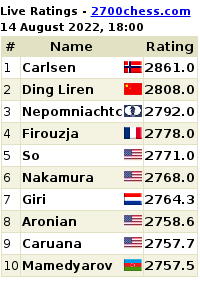 Over nine rounds, these competitors will battle for $300,000 in prize money, points toward the Grand Chess Tour, and the coveted title of 2017 Sinquefield Cup Champion. Join GMs Yasser Seirawan, Maurice Ashley, Cristian Chirila, and WGM Jennifer Shahade for the move-by-move. Daniel King analyses Mamedyarov vs Carlsen from the Sinquefield Cup 2018. In between the 2018 Saint Louis Rapid & Blitz and the Sinquefield Cup, the Grand Chess Tour Players get to have some fun across the board as they are teamed up with Team Rex, Founder of the Saint Louis Chess Club and Team Randy, owner of Spectrum Studios.